Creativity and innovation lie at the heart of North Brabant’s programme as European Region of Gastronomy 2018, as highlighted by Buenavida, the monthly magazine on health and wellbeing issued by the Spanish newspaper El País, that published an article about the region’s capital ‘s-Hertogenbosch titled La Ciudad Laboratorio (The Lab City). Author of the article, Juan Pelegrín underlines the region’s efforts to produce smart food through community working and more sustainable production and consumption systems, and presents some local initiatives that have been developed in the framework of the European Region of Gastronomy title year. Among them, the 4th edition of the City Food & Film Festival described as one of the flagship actions in the region’s programme, encompassing film projections, community activities and conferences related to food topics, organised in the Verkadefabriek, a former biscuit factory recreated as a cultural centre. Throughout their title year, North Brabant has furthermore programmed ten monthly thematic initiatives, symbolically referred to as Kitchens of Brabant, aimed at elaborating innovative solutions throughout the food value chain. The ten initiatives were selected out of 100 ideas submitted by a plurality of local actors, demonstrating a strong engagement of the local community. As reported by Buenavida, North Brabant’s programme opened in March 2018 with the Month of Food Waste, involving both consumers and businesses in a discussion focused on preventing and reducing food waste and improving recycling processes. Among the participating businesses, the magazine highlights Botanic ites, which transforms food waste into new, appetising food products. October has been selected as the Month of #DataFood and is about seizing new data-driven business opportunities and innovations in Brabant’s agrifood sector for a more rational use of food. Pelegrín further reports that, in the long run, application of data science, as currently researched in North Brabant, could help forecast alerts in areas affected by severe food issues. Technology and innovation are combined in North Brabant with an endeavour to reinforce local community’s pride in their food tradition and quality food produce. “We love eating and producing food. We do it passionately and with a strong desire to innovate, not only because we believe it is viable, but also vital” said Lian Duif, Programme Manager of We Are Food, as reported by Buenavida. 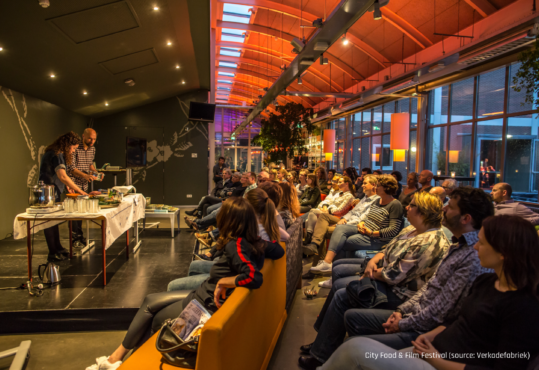 We Are Food Foundation has been created as part of the European Region of Gastronomy title year and researches food habits of the population of North Brabant. North Brabant has been awarded European Region of Gastronomy 2018 together with Galway-West of Ireland and is part of the European Region of Gastronomy Platform which includes today 12 awarded regions from all over Europe.